Campbell Waller shoots a bow Saturday at the Eddy County Shooting Range. Approximately 20 people, including pairs of “bigs” and “littles” from the Big Brothers Big Sisters organization, attended the bowshoot organized by Kathy Kolt of the Artesia Bowmasters club. 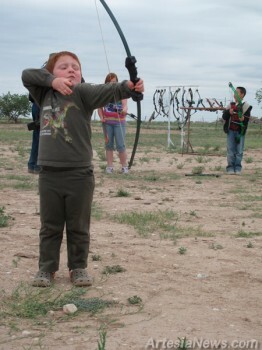 “Give me your kid for 15 minutes and I’ll get him or her hooked on bowshooting,” said Kolt. Also on hand at the event was Artesia Bowmasters member Danny Winters, an experienced bowhunter and competitive bowshooter since the 1960s. Winters taught “bigs” attendees the basics of bowshooting. “Bowshooting is one of the only sports everyone can enjoy…strength means nothing so anyone can enjoy it at any age…it works out perfect for organizations like the Big Brothers Big Sisters,” said Winters.